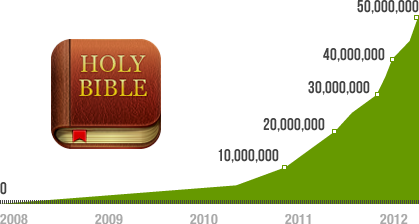 The Bible App has now been installed more than 50 million times. We’re thrilled to see so many people joining in community centered around the Bible. We also believe this is just the beginning. Something much greater is happening: a global shift where more and more people are engaging with God’s Word, and with each other. A truly worldwide community is now equipped to explore almost 300 different versions of the Bible, in 144 languages. With the Bible App on your mobile device, you can read or listen, capture what God’s Spirit is saying to you, highlight your favorite passages, even share your faith with friends on your social networks. Any time. Any place. Now, for the first time ever, you can get a live look at everything that’s happening in the YouVersion community, everywhere in the world. YouVersion’s simple mission remains the same: To help as many people as possible easily connect with the Bible, no matter where they live or what language they speak. Your passion to spread that vision and share God’s Word with others is the spark that’s igniting a Bible engagement revolution. Every time you share the Bible App, you are literally changing the world. Thank you!